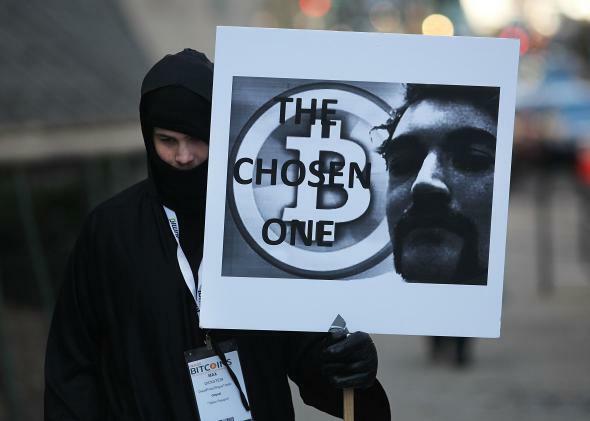 In Silk Road trial, Ross Ulbricht convicted of seven counts. Max Dickstein, a supporter of Ross Ulbricht, outside the Manhattan federal court house in January. Kids, don’t sell drugs online. If you do, you’ll make millions of dollars. OK, that sounds pretty good, but then then you could be convicted of criminal charges and face life in prison. Which is what happened to Silk Road founder Ross Ulbricht Wednesday. So eat your vegetables and don’t found an online exchange for illegal goods. Sound doable? Ulbricht’s trial concluded Wednesday after three weeks with a guilty verdict that took just 3.5 hours of jury deliberation, the Wall Street Journal reports. He was convicted on seven counts related to narcotics, money-laundering, computer hacking, and conspiracy. Ulbricht will be sentenced in a few months and faces life in prison. Ulbricht’s defense consisted primarily of testimony from three character witnesses. He tried to establish that, though he did found Silk Road, he quickly moved on from it and was only sucked back in later by the “real” leader of the site. His attorney says he will appeal the court’s guilty verdict, while Ulbricht’s family maintains that he was not allowed by U.S. District Judge Katherine Forrest to mount a full defense. The prosecution says that evidence from Ulbricht’s computer and digital footprint doesn’t lie. The FBI traced $13.4 million in bitcoin transactions to Ulbricht’s computer, and his personal diaries even played a role in the case.